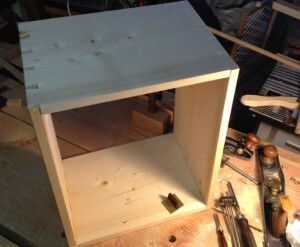 Starting a new project for some drawers in pine. Starting a new project in the shop after some downtime. I wanted to work on a couple skills, and try out a few new ones, so I grabbed a left over pine board (with knots, and voids, and all) and set out to make set of small drawers for my wifes sewing room. Last night I fit the last two corners of dovetails, and it went together pretty well. This is a minor miracle for me really, as I’ve had a hand of these simple dovetail project go awry at this point, so I was very happy to see this come together. I used a much improved marking system to make absolutely sure I had lined it all up right this time, and not repeat the mistakes where I cut the pins on the wrong side, or similar rookie mistakes. Using my new marking knife from Blue Spruce. Simple layout of tails with a divider to step it out, and the Lie Nielson dovetail marker. Sharpening and stropping my chisels before I set to work. Cutting the waste out with my bow/turning saw right to the line. All in all I was pretty happy with things, except for the two times I cut my self on my chisels. I did this over two different evenings, and in true “Underhill” style managed to nick my fingers both times with the super sharp chisel. Next steps are going to push me into new areas. 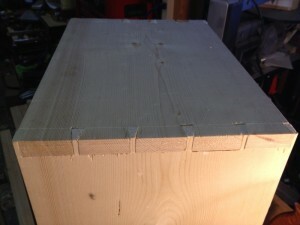 I’m going to make this a three drawer chest (with a little luck, and hopefully some small amount of skill). I’m going to cut some dados and build out some drawer supports. If all goes well, then I’ll start building some drawers for it, and maybe even carve the fronts with some strapwork designs I’ve discovered.